V.C. Andrews - The Mirror Sisters. Book one In a trilogy. The Mirror Sisters is the first book in a new series featuring identical twin sisters made to act, look, and feel truly identical by their perfectionist mother. Alike in every way...with one dark exception. As identical twins, their mother insists that everything about them be identical: their clothes, their toys, their friends...the number of letters in their names, Haylee Blossom Fitzgerald and Kaylee Blossom Fitzgerald. If one gets a hug, the other must, too. If one gets punished, the other must be, too. Homeschooled at an early age, when the girls attend a real high school they find little ways to highlight the differences between them. But when Haylee runs headfirst into the dating scene, both sisters are thrust into a world their mother never prepared them for—causing one twin to pursue the ultimate independence. The one difference between the two girls may spell the difference between life...and a fate worse than death. Written with the taboo-breaking, gothic atmosphere that V.C. 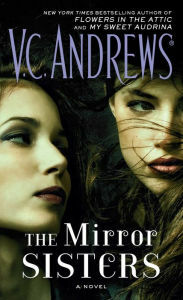 Andrews is loved for, The Mirror Sisters is the latest in her long line of spellbinding novels about mysterious families and tormented love. Yes! This is written in a taboo breaking, gothic atmosphere but it stopped there. This didn't feel very V.C. Andrews like to me. It took so long to get moving because we spend the first half of the book hearing about how very similar the girls are. I get it..the title is Mirror Sisters and the similarities could have been covered in a page. Here's the thing...if it didn't have V.C. Andrews on the cover I would have zero expectations and read it as any other book but there is a legacy it needs to live up to and it didn't however the ending...was the perfect cliffhanger. Although the whole way through you basically know one sister is completely setting up the other and the one being set up is as described a very smart girl so where she ends up at the end of the first book in this trilogy is a little annoying. However, with that being said, if she completely didn't trust the one sister, we wouldn't have a trilogy. Anyway. Haylee and Kaylee are the exact duplicate of each other in appearance but not in heart, attitude or brain. One is really manipulative and thinks nothing of hurting people and the other spends the whole book uncomfortable with the things that she is forced to accept and go along with but there is a reason for that. Their mother! Mom is a little crazy. She wants them to be the perfect duplicates of each other right down to hurting one because the other got hurt and this one must also have the same marking or they will not be perfect duplicates. I won't give anymore away. It is an OK book. I didn't hate it but I didn't love it. Alone without the legends name I would be OK with it. When the second book comes out I do plan on reading it because the cliff hanger was intense and I really can't wait to find out what happens next.